I tried hard to read Appelt's, The Underneath, but the evil in it terrified me. In spite of that, I have had numerous children come to me with the book clasped tight against their heart, asserting it is the best book they have ever read. 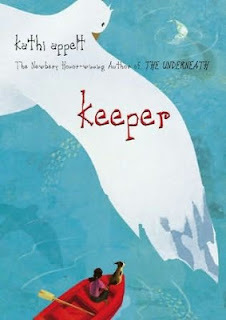 So when Keeper came along, I didn't know quite what to think. Honestly, I avoided making a decision and consequently never purchased it. When I found it as an audio book in the public library, I decided I should give it a try. I'm so so so glad I did. First off, it is truly a beautifully written book. It's a story about an odd sort of family who live on a road that borders the Gulf of Mexico. Keeper is a young girl who has had a DISASTER of a day. It was all because the crabs for the special blue moon gumbo told her they wanted to be set free. As a result of listening to them she ended up hurting all the people she loved most in the world. To make amends, she set off in the dead of the night of a blue moon in search of her mermaid mother. Second, It is truly a beautifully written book. It's a dreamy whirlpool of a story. With each drowsy rotation the story picks up and combines details into an increasingly complex, richer narrative. It spirals round and round revealing itself through the different perspectives of the characters. The reader, pulled deeper and deeper into its world, hangs on the cusp of that vortex. Each time it winds itself back to Keeper, not only do we learn more about her, we also see her spin closer and closer to calamity. Third, It is truly a beautifully written book. The language is pure poetry. It is magical, tense and harrowing. This should mean I could probably sell a large number of kids on it. But at the same time it is V E R Y slow paced. It edges snaillike towards the final climax - and even that is satisfying, but not spectacular. This is more of a book about characters and how they came to be who and where they are than it is about plot. I will most certainly get a copy for the library. I am positive I will find enough readers to justify its purchase. Perhaps I can convince a teacher to read it out loud to his or her class.